A new version of Manick Sorcar’s original classic art was purchased by an Arizonan couple who visited Manick's art exhibition last September 25, 26, 2010 at the Sorcar Art Gallery. Why a new version? 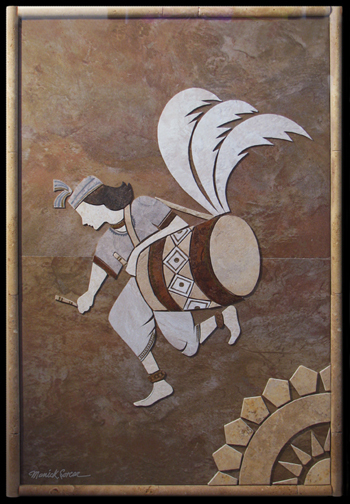 “We love this tile-collage art; it is perfect for our home in Phoenix, Arizona ”, said the customers, “but we wish it was slightly larger with a unique touch somewhere - that would make it exclusive for us”. Manick fullfilled the young couple's wish. He crafted another one larger than the original, and with a floral design to make it unique for them. The new art piece is 30”W x 40”H with the frame and weighs 30 lb.